Subsidence: what is it, how do I spot the signs and what should I do? Subsidence is a word dreaded by home owners and home buyers alike. It can potentially affect a house's structural safety and value. We look at what subsidence is, how to avoid it, how to spot it and what your options are for getting it fixed, as well as future implications for any future sale of your home, and whether it's a reason for home buyers to walk away from a deal. Subsidence occurs when the ground underneath your house sinks. As the ground moves lower the foundations of your house can become misaligned. It is particularly problematic when the ground under your property is sinking at different rates. Subsidence is not the same as heave, which is where parts of the ground under your home shift upwards pushing the foundations higher. It is also different to landslip or landslide where the ground your home was built on moves down a slope or is washed away. It is also worth noting the difference between subsidence and settlement. According to the Financial Ombudsman Service, subsidence is caused by the ‘downward movement of the site on which a building stands – where the soil beneath the building’s foundations is unstable’. Whereas settlement is “downward movement as a result of the soil being compressed by the weight of the building within ten years of construction”. It is important to know the difference as most insurers don’t cover settlement. Are cracks in my house a sign of subsidence? One crack in a wall is not a sure sign of subsidence. It is far more likely that the crack is a result of the walls or ceilings of your home swelling and shrinking over time due to temperature changes. Also, a new home – or one that has had some major plastering – may develop some cracks as the plaster dries out or the structure settles onto its foundations. Cracks aren’t the only sign that you may have a subsidence problem. You should also look out for doors and windows that stick as this could be caused by the frames warping as part of your house sinks. Keep an eye on wallpapered rooms for signs of rippling at the wall and ceiling joints. You may also spot cracks where an extension has been joined to your main home. I’ve spotted suspicious cracks in my house, what should I do? If you think you may have subsidence, the first step is to contact your buildings insurer. The sooner it is picked up the easier it will be to deal with. 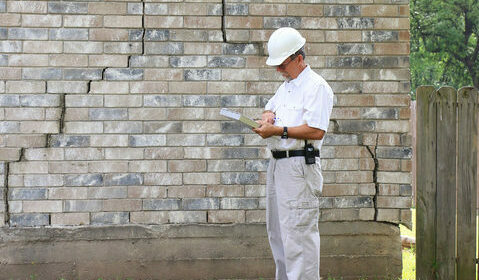 The insurance company will arrange for a surveyor to inspect your home and confirm if it is subsidence. It may be that the surveyor decides your home needs to be monitored before they can determine whether the ground is sinking. This can take up to 12 months. The concern with telling your insurance firm straight away is that it could mean your insurance premiums rise, even if it turns out you don’t have subsidence. Our partners at A-plan tell us they would not expect premiums to rise if no problems were found, but all insurers view risks differently. So, you might want to consider getting a professional to confirm you have subsidence before you involve your insurer. Which houses are most at risk of subsidence? Some homes have a greater chance of sinkage than others due to a variety of factors from the type of soil they sit on to the local climate. Trees – If you have trees or large shrubs planted too close to your home they can cause subsidence as the plant drains the moisture from the soil causing it to dry out and sink. Estimates suggest that around 70% of all subsidence cases are a result of tree roots absorbing all the moisture out of soil. Clay – This type of soil changes a great deal with the weather. When it is hot and dry it can shrink, crack and shift which makes the ground unstable and there is a greater risk of it sinking. Drought – If you live somewhere that is prone to a drought then the soil could dry out which increases the chance of subsidence. Leaks – A leaking drain or water main can soften the soil, or wash it away, causing sinkage. Age and construction – If you live in a period property there may be a greater risk of subsidence as your house may have shallower foundations than a more recently-built home. However, the flipside of this is that older properties tend to be built from bricks and lime mortar which could make them more flexible and less likely to be damaged by the ground shifting beneath them. Mining – This is one of the more well-known causes of subsidence. If your house has been built near to a former quarry or pit, then it could be unstable as the material used to fill the site will shift as it decomposes. Your house could also be affected if mining activity occurs close by. You can purchase a subsidence claims report from the Coal Authority to see if your property is affected. If you live in a house that is at risk of subsidence, then there are a couple of steps you can take to reduce the chances of your property sinking. Firstly, keep the trees at a safe distance. Don’t plant any trees within 10 metres of your home and particularly large trees should be no closer than 40m. Secondly, try to catch excess water. Avoid your soil from becoming waterlogged by using water butts to collect rainfall. Also, keep your guttering, pipes and plumbing well-maintained to avoid leaks. If your subsidence is being caused by tree roots then the easiest solution is to remove the tree, but you should only do so after consulting a surveyor and with the help of a tree surgeon. If you get it wrong, you could make the situation worse and cause more instability. Similarly, if leaky pipework is the cause, get this fixed and see whether that helps the property to stabilise before looking at other options. In the worst cases of subsidence, your house may need to be underpinned. This can be expensive and disruptive with costs reaching £50,000 in some cases. The good news is the Royal Institution of Chartered Surveyors (RICS) estimate that less than 10% of properties that are affected by subsidence need underpinning. It is only used as a last resort. Claims data from the Association of British Insurers suggests that in most cases the cost of dealing with subsidence is much lower as the average payout is £6,250. When you are viewing properties keep an eye out for the signs of subsidence. Ask the seller and estate agent directly if the house has suffered from subsidence. If you are interested in buying a property that you suspect may have subsidence get a full buildings survey done, this should inform you if there is any risk of subsidence. Your mortgage lender’s valuation is not a survey into the condition or structure of the property so will not highlight subsidence; you will need to get a full survey done yourself. If repairs for subsidence have taken place in the past your conveyancing solicitor should get legal documents from the vendor to verify that the repairs were done to the standard set by the Building Research Establishment. These documents should include a formal Completion Certificate, which is issued by the council if the property has been underpinned, and a Certificate of Structural Adequacy, which should have been created by a building surveyor if the repairs were part of an insurance claim. Many repairs come with guarantees which you will want to have passed to you. Your conveyancer will be able to find out who the property is currently insured with and for how much. You should shop around to see what the options are as your choices may be limited or policies more expensive.